If you use a personal iPad for work, one of the scariest prospects you can imagine is that IT will wipe its contents if you report it lost or stolen, or if you leave the company. After all, the iPad stores not just your apps but also documents, music, movies, and more — your stuff, not your company’s. And, yes, typically when you connect your iPad to the company’s network, such as to get email, you are giving IT the right to do that wipe. The right answer is for IT to not wipe your iPad in the first place, but rather to disable your account access from it. Some mobile management tools are smart enough to wipe just corporate apps and data, leaving the rest of your iPad’s contents alone. But you don’t want to discover the hard way if your company uses such a smart tool. 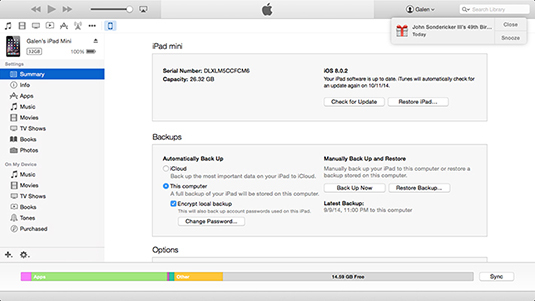 iTunes Backup copies everything on your iPad to your computer. And if you enable encrypted backup in iTunes, your passwords are backed up, too. Plus, both your information and your company’s is secured on your computer — a win-win should your computer ever get stolen or hacked. However, some companies impose a policy on your iPad that blocks the use of iTunes Backup. And iCloud Backup, if permitted, doesn’t save your files or media content that wasn’t purchased from Apple. You should always keep a copy of such media content on your home computer so that it can be shared with other devices, too. As for files, use a cloud storage service instead of storing them (only) on your iPad. Whatever you store in the cloud — Apple’s iCloud Drive, Google Drive, Dropbox, Box, and so on — isn’t touched by a device wipe. Sure, the cloud storage apps might get wiped from your iPad, but the documents are still stored on the service, available from your computer and other devices — and from your iPad when you reinstall the wiped apps.